Each part of the motorcycle needs specific care. 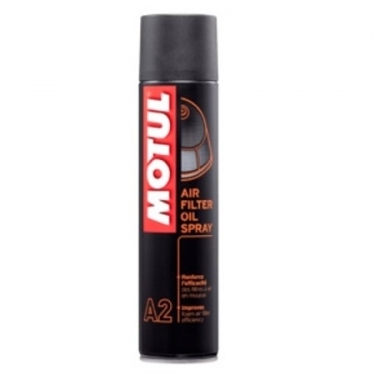 Launched in 2011, Motul® MC Care ™ line has been developed to fully maintain and care for the motorcycle, the motorcyclist and their equipment.Product category: Air Filter Maintenance CareMotul® MC Care ™ A2 Air Filter Oil Spray is a blue-coloured lubricant specially developed for the maintenance of foam air filters of off road bikes and ATV's. Improves air filter efficiency for better carburation. Effectively retains dust, mud and sand for greater engine durability. Prevents water from entering the filter.